Fraternities and sororities are founded on the principles of scholarship, leadership, and community service. In addition to developing leadership skills, attending social events, and serving the community, being in a fraternity or sorority is about forging friendships that will last far beyond the college years. With events like the Greek Carnival during New Student Orientation, Greek Week, and the Float Parade during Homecoming, the Greek community is an integral aspect of WPI, and you’re invited to be a part of it. Here are only a few examples of what members of the Greek community gain from being fraternity or sorority members. Academic support and excellence: Our fraternities and sororities pride themselves on academic success. Whether you need help choosing a major, applying for scholarships, or sharpening your study skills, your fellow chapter members are always there to offer support and advice. Community service experience: Members of WPI’s Greek community perform thousands of hours of community service every year by volunteering in homeless shelters, tutoring kids in local schools, cleaning up trash in local neighborhoods, and more. Leadership and personal development: From serving in a new member office or representing your chapter on a governance council to serving as chapter president, the confidence and skills you’ll develop as a fraternity or sorority member will help prepare you for the professional world. Lifelong friends and community building: As a member of the Greek community, you’ll connect with people from all different backgrounds who will become your closest friends—friends who will congratulate you when you succeed, support you when you falter, and remain with you long after WPI. Networking and alumni involvement: Chapter alumni are eager to help their fellow members, whether by serving as career advisors or trusted mentors. With many opportunities to interact with your chapter’s alumni, you’ll be part of a beneficial network that could lead to your next internship, summer job, or professional career. Login to TechSync to stay informed on student events and activities related to fraternities and sororities. 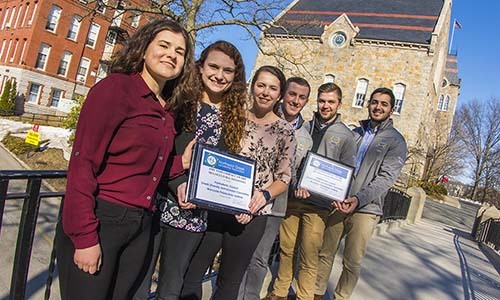 WPI's Greek community was recognized for proactively addressing inclusion, sexual assault, risk reduction at the Northeast Greek Leadership Association’s (NGLA) annual conference in February. Members of the Class of 2017 reflect on the impact their involvement in Greek Life had on their WPI experience.